Remembering that we, too, often need help. Margarette Owen, later Mrs. Oliver Golding the wife of a Manchester Rotarian, was born of Welsh parentage at Hey-Brecon. She was trained as a nurse and had served during the First World War. This triggered off a deep desire to help all ailing, deprived humanity. She was an extremely capable business woman and a great philanthropist; her chief social interest being the Manchester Girls' Orphanage & Ancoats Hospital, for which the Inner Wheel of Manchester provided and furnished a mortuary chapel. She also did a great deal for the Girl Guide Movement, in which she held the Office of Commissioner. She formed, directly and personally, numerous Clubs and several Districts and her inspiration is remembered to this day; she successfully achieved even harder task in persuading Members to look beyond their local concerns and become part of a greater whole and serve the Society. Here was a vital personality combined with a clear brain and the ability to convey ideals to others. She was an excellent speaker and had a lively sense of humour which enriched her words. Nature had bestowed her with gift of inspiring friendship and devotion. Her greatest attribute was courage and courage was what Inner Wheel needed in the beginning. Inner Wheel was firmly established during her lifetime upon the path which it was to follow thereafter. The Inner Wheel is the world's second largest women's organization and comprises of the women folk of Rotarians. It is a recognized voluntary Non-Government Organization to help and serve the needy and underprivileged sections of the Society. In recognition of its social service, it has got representation in the United Nations Economic and Social Council. The Inner Wheel concentrates upon Friendship and Personal Service. It is not what is termed as “a money raising organization”, though each Club selects its own charities and channels of service. One of the greatest features of Inner Wheel is the opportunity given to its Members the world over to get to know one another, thus contributing to International Friendship and Understanding. How Was Movement Of Inner Wheel Started? Mr. Paul Harris started the first Rotary Club in 1905. In 1920, the wives of Rotarians in Great Britain and Ireland joined hands to help their husbands with social work undertaken by Rotary. The friendship resulted in forming the Inner Wheel. In 1924, the Manchester Club of England was formed and was provided the name Inner Wheel. As time passed, many Inner Wheel Clubs came into being and in 1934 the Association of Inner Wheel Clubs in Great Britain and Ireland was formed with Mrs. Oliver Golding as the founder President and Mrs. Nixon as the Secretary. They realized that unity is strength and had the wisdom to group Clubs into Districts and then later to bring the Districts together to form an Association. Since then the movement has grown rapidly and spread all over the globe. The first Inner Wheel Club in India was formed in 1955 in Ahmedabad. In 1968, when the International Inner Wheel President came to India, there were three Inner Wheel Districts: Gujarat, Saurashtra and Bombay. The International Inner Wheel (I.I.W.) President combined them and named it as National Council of India. With the expansion of Inner Wheel Clubs and Districts in India, in the year 1976 the Association of Inner Wheel Clubs of India and Sri Lanka was formed. In 1985 Sri Lanka was separated and Association of Inner Wheel Clubs in India came into existence. Do your Clubs in the District have difficulty in finding Presidents? Do your Clubs have 50% of the Members who have been Past Presidents? Do you have less than 60% attendance at meetings? Do you have Members who are just there on the roster and do not attend meetings? If you have any of these situations in your Club, yes, you need New Members. New Members are very choosy. They join the Club only if they feel comfortable with the group of Members i.e. Fellowship. Only then they can enjoy themselves and take part in the Club activities-Good and interesting Club Programmes, Picnics, Factory Visits. The quality of Programmes makes a great deal of difference. A Member may belong to 1 Club only. The wife or female partner of a Male Rotarian. Membership may be retained or taken up again notwithstanding the resignation or death of the Rotarian. The wife of a Rotarian or a former Rotarian. The wife/mother/sister/daughter over 18 years/step daughter over 18 years/ daughter in law over 18 years of any Rotarian or former Rotarian. The mother/sister/daughter over 18 years of an Inner Wheel Member. A female Rotarian or a female former Rotarian. Former female Member of Rotoract or the wife/mother of a Member of Rotoract. A female who has participated in a programme of Rotary International, such as Students Exchange Ambassadorial Scholarships and Group Study Exchange (GSE)- and who has been personally invited to join. Honorary Members having served for atleast two years within a club may be offered membership as Active members of that club, provided a majority of the club agrees. This category of membership must notexceed 4 at any given time. Active Membership should be taken up in the Inner Wheel Club most convenient for a qualified Inner Wheel Member to attend. A Club may confer Honoured Active Membership on an Active Member who has given outstanding service to Inner Wheel. The Club will pay the Member's due for the year in which Honoured Active Membership is awarded. In the following years, she retains Honoured Active Status but pays all her own dues. Such a Member retains all the rights of Active Membership for life or until she leaves Inner Wheel. Clubs may invite up to 4 female Members whom they wish to honour to become Honorary Members. Honorary Members have no vote and cannot hold office in a Club. Having served for atleast 2 years within a Club, Honorary Members may be offered Membership as Active Members providing the majority of the Club agrees. These Members shall then have Active Members rights. This category of Membership must not exceed 4 at any given time. Members who transfer to other Clubs will be admitted as Active Members of those Clubs. Extension: Who is responsible for Extension within Clubs? By the energy and enthusiasm we put into our Clubs. By demonstrating to prospective Members the warmth, the caring and the sharing we have to offer. By working together on Club Projects; by adding social activities to our programmes which are fun and which create a feeling of belonging among Members; by adapting our programmes to meet the needs of all Members. These will Increase our enjoyment of Inner Wheel and may create an interest among Non Members too. Can each Club set a goal of introducing Inner Wheel to at least 2 Non Members in the coming year? Let's Try, You and I. If you don't put anything into a trumpet, you won't get anything out of it. It takes a lot of planning, a lot of hard work, and a lot of caring to make a success out of all you do. The official emblem consists of 2 gear wheels one inside the other, with 6 spokes radiating outward from the centre hub. There are 24 teeth on cogs on both inner and outer wheels. The word “Inner” appears at the top and the word “Wheel” at the bottom of the rim. So don't forget to oil the HUB, which helps to make the gear run smoothly. The colour is also important which is ROYAL BLUE for the Clubs and LIGHT BLUE for the Districts. 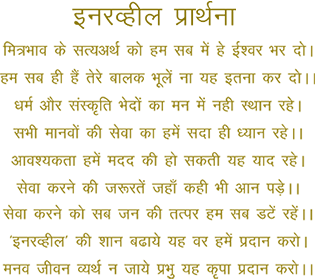 An award created in the name of Margarette Golding for highly commendable personal service through Inner Wheel or in the community. The very first Margarette Golding Award was presented to Margaret Palmer, Administrator / Secretary of International Inner Wheel by the then IIW President Carole Buchanan in Chester, England. The First Lady Indian Recipient of the Margarette Golding Award was (Late) Mrs. Vijayatai Lawate in the year 2004. The Second Lady Indian Recipient oft the Margarette Golding Award was Mrs. Rakshaben Mehta (Dist 314) in the year 2007. 10, Gyan Lok, Hapur 245101, Uttar Pradesh. Protocol, carried effectively maintains the decorum of any meeting and adds dignity. Protocol is the formal etiquette and procedure for formal ceremonies. It is a code of behavior and set of courtesies, which add grace, beauty and dignity to any function. It also enhances the stature of all those who observe these customs and creates an ambience of goodwill and happiness all around. Inner Wheel being an international organization and having different layers of administration has plenty of scope for both - the need to follow certain decorum and the desirability of observing proprieties. Protocol has many facets and must be applied and followed in different ways. Seating arrangements at various meetings. Addressing the Inner Wheel dignitaries. Protocol to be followed during visits of Inner Wheel dignitaries. This is to be followed at the District Meetings such as District Assembly/ Conference. (a) When there is no separate Chairman for District Assembly / Conference. The Conference/Assembly Chairman is often a senior Member of the Club/District. She is nominated for her experience and she is there to help organize, supervise and guide the arrangements. It facilitates arrangements, if the host Club President is nominated as the Conference/Assembly Secretary. The President always presides at the Club function and is seated in the centre. Similarly, the District Chairman occupies the Centre seat at a District Function. The District Chairman/Chief Guest is on the right or left of the Club President. The Association President/Chief Guest is always on the right or left of the District Chairman. If District Chairman is present, then she will be addressed after the Club President. If both the Association President/District Chairman are present, then after the Club President, the Association President and then the District Chairman will be addressed. If the District Chairman is present, she will be the Chief Guest. Chairman presides and to be addressed first. If Association President is present, she is next. If IIW President is present, then she will be addressed first and Association President after her. Association President is the Chief Guest at the District Conference/District Assembly. Any other speaker can be a guest speaker. All PDCs, Past and Present Association Officers, District EC Members (if not on the dais) are to be seated in the first row. IIW or Association Officers are addressed before District Executive, PDCs, dignitaries and Members of Inner Wheel. The above will be addressed before acknowledging Rotary dignitaries and guests. The spouses of the District Chairman and District Officers, if present, must be seated in the first row, and their presence acknowledged. The first lady of Rotary District also must be seated in the front row and her presence acknowledged. District Chairman/Club President receives the Association President / District Chairman. The Visiting dignitary must be seen off by District Chairman / Club President. Be prompt in replying, especially to an invitation. Each invitation card of Club / District must have District Number. It must have at least one full R.S.V.P. address with pin code and telephone number for acknowledgement. Colour of Inner Wheel emblem, badges and collar should be uniform. Colour of Badges and Ribbon of the Collar: Royal Blue of Clubs – Light Blue for District. Wear your lapel pin at all meetings. If chairing a meeting, wear the Collar. We are Members of Inner Wheel and not Inner Wheelers. Don't use or encourage the use of Chairperson – it is Chairman. Don't print International Inner Wheel on your stationary. Use only Inner Wheel District Number and not Rotary District Number. Use the name of the Club as it is given in the Charter. Club Charter must be handed over at the Club Installation and preferably shown to the Chairman during her official visit. Inner Wheel prayer to be read at the start of an Inner Wheel meeting. Be aware of Rules, Constitutions and Bye Laws. Do not hesitate to refer to them as often as necessary. Carry them with you on all Official visits particularly District Assembly / District Conference / Visits to Clubs. Check that you have the latest copy and not any outdated one. Check that the Clubs / District E.C. Members also have the latest copies. Do not ask the invited Inner Wheel Member or guest for any contribution, sunshine or raffle. Do not impose yourself on others, while visiting other cities, districts or countries. Share news, views and responsibilities with your E.C. Members. Be impartial, fair and just in case of any dispute. Inner Wheel is an International Organisation. Administratively, it functions at 4 levels. India is the 2nd largest Association. Inner Wheel is totally democratic at all levels. Every office is an elected one and every Club has a right to vote. IIW is governed by a Constitution and it is amended every 3 years at the IIW Convention. Once in three years an International Convention is held, proposals are submitted to amend the Constitution. A conference of the Association or the Triennial Conference is held once in three years and amendments to the byelaws of the Association of Inner Wheel Clubs in India are passed by a majority of the Voting delegates. It is usual for Clubs to meet monthly although some Clubs do prefer to meet fortnightly. Where Clubs have a speaker at the meeting, the business session should be transacted before the speaker arrives. Minutes of the previous meeting to be read, confirmed and signed. 20% of the Members of the Club form Quorum for the General Body Meeting and 4 Members form Quorum for the Executive Meetings respectively. At least 10 General Body Meetings should be held in one year and Executive Meetings should be held depending on the needs of the Club. 30% of the District Committee or any Standing Committee shall constitute a Quorum. The District Committee shall meet atleast twice a year (held during July Assembly and December Conference time). Meetings of the District Executive Committee shall be held as often as necessary. + 16 Board Directors are elected annually. 4 Officers and 16 Board Directors constitute the IIW Governing Board. National Representative and Deputy National Representative are the link between the IIW and the National Body. Two District Delegates from each Club and an Additional Delegate may be elected by Clubs with 51 or more Active Members. Please inform the new Club Treasurer that when forwarding the Demand Draft to the District Treasurer, she must give full details in the letter, regarding Members' remittances, and also have to advise whether these are full or half yearly fees. Please guide the Club treasurer to draw out the Demand Draft in the District's Name and not in District treasurer's personal name and post it to the District Treasurer under Registered. A. D.
The District Secretary will retain 1 copy and will send 1 copy to the Association Secretary for information. The District Treasurer keeps a copy for her file and sends the other copy along with the Association, Triennial and Capitation Fees to the Association Treasurer. The Association Treasurer verifies all information and confirms to the National Representative / Association President, that the newly formed Club has paid all the dues. The National Representative / Association President after verification and on receipt of confirmation from the Association Treasurer sends the duly completed Origin Charter Application Form along with the Rotary or Inner Wheel Sponsorship Letter to the IIW Headquarters and keeps one Xerox copy for her file. 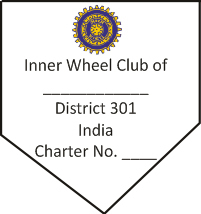 All Charters are granted by International Inner Wheel and signed by the International Inner Wheel President, the Association President / National Representative and the District Chairman. If all the above formalities are strictly adhered and followed, one can expect to receive the New Charter within 6 months or a little earlier. This year few charters were received within a short span of30 days. A word of caution: Please avoid any overwriting or erasing on the Original Charter Application Form, take a Xerox copy of the blank Original Form, and start filling with details. After thorough checking that everything is written correctly, then complete the original form. The Inner Wheel is a democratic organization at all levels. Every year there is a change of guard and this change is brought about through election. It is important that these elections should be held in a fair and impartial manner. This depends a great deal on the District Chairman. She is the vital link between the Clubs and the District on one side and the Assn. and I.I.W. on the other side. Elections conducted in the right spirit generate great enthusiasm and trust all around. It creates a feeling of goodwill which makes for efficiency and smooth working of the organization. It is essential that the Election process is taken seriously and everything done very carefully for there is what is called a ladder system. Every Office held at the lower level qualifies one for the higher office. Any mistake can lead to problems later not only procedural but also constitutional. Candidates – I.I.W. Constitution and Association bye laws have set down their qualifications and the election procedures very clearly. It is important to go through the qualifications carefully as they are liable to change after IIW Convention and Triennial Conference. Please go through these qualifications very carefully for they are liable to change and can be amended. As District Chairman you must emphasise the importance of these qualifications to the Clubs for that is where the real ladder starts. Club election may be routine but nevertheless they are very important. The District Chairman must see that all the Clubs in the District have paid their dues. This is what entitles them to a vote in the District, Assn. and I.I.W. elections. Nominations must be very carefully filled, after verifying that the nominees fulfill all the qualifications laid down. Along with the nomination it is necessary to send the consent of the nominee in writing. It is a must. It is the responsibility of the Club, District, Assn. to ensure that the candidate has the mental and physical capacity to discharge the duties of the office. The photograph which is necessary for higher levels of Assn./I.I.W Elections must be a recent one taken within 6 months. The bio data of the candidate also needs attention. It is necessary at all levels. But at the Club and District level it can be on the letter head of the Club, for the Assn., I.I.W. elections there is a proper format which must be adhered to and has to be submitted in printed forms. Please put in only what is asked for and the personal bio data has to be put in the space provided for. It must be in the number of words which are specified. Do not miss out any qualification. Procedure of Election has been explained in the I.I.W. Constitution and Handbook. There are four levels - (i) Club (ii) District (iii) Association (iv) I.I.W. Election must be held before 31st December and nominations made in writing atleast a month before the Election. Direct responsibility of Club President and Executive. Proper notice to be given to the Members and procedures followed. Nominations can be invited from the floor of the house, if there are no nominations for the Club Executive Post. The candidate proposed must fulfill the essential qualification the office concerned. These are always held at the time of District Conference. District Secretary calls for nomination well in advance (usually in September) in consultation with District Executive. Appoint a Scrutiny Committee with a senior Member of the District to check the nomination forms with District Chairman and District E.C. District Secretary to circulate the nominations with brief bio data of the nominee not less than 30 days before the District Conference. Proper arrangements for balloting at the District Conference to be made i.e. ballot papers, ballot box and appointment of senior Members of the District for the conduction of elections, usually Past District Chairman. District Chairman has the casting vote in case of a tie. No Club can have more than two Members in the District Executive. Voting is done by the voting Delegates. Clubs having more than 51 active Members have one extra Voting Delegate. If the Voting Delegate is not attending the District Conference, a Deputy may be appointed, who carries a letter on the Club Letter head, signed by the Club President and Club Secretary, which states that these Members have been nominated at a Club Assembly, held ………….date as voting delegates. This letter is a must and should be handed over to the Election Officer. No Voting Delegate can cast more than one vote. For voting, always put only an X. Any other mark is invalid. Votes polled are not disclosed. It is the duty of the District Chairman to abide by the bye laws and act in an impartial and correct manner. Only then true democracy can prevail. Elections to different posts are held throughout the year. As different ballot papers are received by the Clubs, one should be careful. It is the duty of the District Chairman with the Executive to guide the Clubs properly. Association Elections are held by Postal Ballot. The Association Secretary sends out the Ballot papers with the Ballot Envelope to the Club President. It is essential that the official ballot paper should have been signed by the Association President, Immediate Past Association President and Association Vice President. The Club decides at their Club Assembly and marks their choice with an X, send the Ballot Paper in the given envelope, and write the name of the Club and the District number on the envelope. The flap of the envelope has to be stamped with the rubber stamp of the Club. A ballot returned in an envelope without the stamp of the Club on the flap will become invalid. Please post it immediately, taking into account the postal delays. Internal elections for Board Director or IIW offices if there are more than one candidate. Association Vice President/ Deputy National Representative. Club Presidents directly receive the ballots from the Association Secretary. Chairman must impress upon the Clubs to send their votes in time to avoid unforeseen delays in Postal delivery or other problems. Send the ballots by the registered post / courier / speed post, do not enclose any other written matter in the envelope and follow the instructions strictly to avoid invalidation of the ballots. The Club should also be told to cast properly. Put an X .only beside the name of the chosen candidate passed at your Club General Body Meeting. Distribute these forms at the Incoming Officers' Institutes and carry them along for illustration at the official visit. Chairman is the most important field officer to convey the significance of their power and duty to wards real and effective democracy. Due to repeated efforts the percentage of voting has gone up but still needs improvement. In some Districts, Clubs do not vote. Chairman receives the information copy from the Association Secretary. Kindly follow up immediately with the Clubs and send request for duplicate ballot at the earliest. Ensure that Clubs really need the duplicate ballots for; sometimes the Clubs send both the original and duplicate ballots. Clubs get confused between IIW and Association elections as they receive ballots for both the elections in December. For IIW Elections, last date for receipt of ballots at IIW Head Quarters is always 31st March of the year but for Association Elections, last date is given as decided by the Association. Club Secretary directly receives the ballot with the bio data and returning envelope from the IIW. For Board Director, Clubs have to put X against 16 names only. At IIW level the name of the candidate always starts with her second name i.e. it will be Marfatia G for Gulnar Marfatia, Balijee R for Renu Balijee or Ramakrishnan K for Kamala Ramakrishnan. This must be understood properly. Write the name of the Club exactly as given in the Charter. Any other will make the vote invalid. Do not put any other letter in the envelope. Post the ballot immediately; do not wait for the last date. Return Envelope from IIW along with the ballot must be adequately stamped and marked AIRMAIL and instructions followed. If any Club has not received the ballot by the 25th December of the year, inform the Chairman who in turn must inform the Association Secretary / National Representative. IIW usually does not entertain the request for duplicate ballots. Please put a CROSS beside your choice of Vice President. No other form of voting paper will be accepted. More than one cross or any other mark will invalidate the voting paper. This voting paper must be returned to international Inner Wheel headquarters by 31st March, 2013, sealed in the special white envelope provided. Please put a CROSS beside your choice of Editor. Please put a CROSS beside your choice of BOARD DIRECTOR. Voting for more than 16 or less than 16 will invalidate the voting paper. Not other form of voting paper will be accepted. Mark AIR - MAIL on the envelope and paste Air Mail postage. The Club Executive Committee consists of the Officers, Club Correspondent, The International Service Organizer and not more than six ordinary Members of the Club. Club may, if they so wish appoint a Joint Secretary. The President and Secretary of the Club are ex officio Members of all Club Committees with power to vote. Members may be co opted to advise the Executive Committee or to receive instructions regarding the particular work assigned to them. They may take part in discussions, but may not propose or second motions and have no voting power. The new Inner Wheel Year starts on 1st of July. The installation must take place by the first week of July at the latest. The President is installed, the jewel handed over and then she conducts the meetings. All files, relevant records, literature and documents should be handed over to the President towards the end of June. 2. Have you the following items? Bannerettes for display and exchange with other Clubs. Forms for registering new Members. 3. District Committee Meeting Minutes or at least important parts from them must be read at the Club Meetings. Members should know, what is going on in the district and take an active interest in it. Take an active interest in the above matters. Reply to correspondence regularly and promptly. Must be in time. Think about it in October and November. Explain to the Club in November. Forms should be sent in time. 6. Observe International Inner Wheel Day on 10th January, by some form of special service. 7. Election Meeting in December. 8. On receipt of Association ballot papers, go through the biodata of the candidate in the Club Meeting, cast the vote and return the ballots in time. 9. If ballots are not received in December inform District Secretary immediately. 10. Nominations of Delegates to the District Committee. Be careful in their appointment and selection. They must be willing to attend District Committee Meetings, Assembly and Conference. Must vote and do as Club directs. Must report back to the Club. Must keep notes of the Meetings they attend. Good to have the President and Secretary/Treasurer as delegates. Remember, Delegates are eligible for District Offices. They are Ambassadors. So make the best choice. Encourage Members to become Delegates. If a Delegate is unable to attend a District Committee Meeting, the Club President must give a letter of authority on the Club letterhead, to a Deputy Delegate, who should have served at least one year on the Club Executive Committee to attend the Meeting. 11. Annual General Body Meeting must be held in June. 12. Directory forms to be sent by 30th March. For any kind of help remind the District Chairman and the District Secretary, who are always at your disposal. Treat them as your friends, and do not hesitate to approach them. The President presides over all meetings, and is responsible for the interests and well-being of her Club. She should be impartial in all matters, her aim being to promote Friendship and Service by personal contact with every Member of the Club. The IIW Constitution and Handbook Association Bye Laws, Distt. Committee Rules should be studied thoroughly, and refer to them without hesitation. This is better than making a mistake. If the above Rule Books are not available, an order has to be placed with District Treasurer, including the International Inner Wheel Directory. Accept suggestions from your Members, with an open mind and plan your activities and projects, well in advance, with their co-operation. Every month, tell your Members in brief, all that has taken place in the Club, during the month. Welcome “New Members” correctly, always following the procedure of the IIW Constitution and Handbook, 2000. Try and increase your Membership. Arrange as many Fellowship Programmes, as possible. Be prompt in your correspondence with International Inner Wheel, Association President, District Officers and Link Clubs. Encourage and persuade your Members to attend Club and District Level functions in large numbers. Work in harmony with your Secretary, because it is she who takes the brunt of the work. Resign yourself, to giving quite a bit of your time to Inner Wheel work, during the year. Be just in your decisions. Make sure of “unity” and “frankness” amongst fellow Members. Act immediately and see that each Member is doing her bit by rendering some personal service. Offer “hospitality” freely to the Inner Wheel Members from other Districts. All letters and correspondence from the Chairman, District Correspondence, Association President, IIW Magazine, etc., should be read to Members at the meetings. Check Association Directory and District Directory for any mistakes in the names and addresses of the office bearers and inform the District Secretary. Prepare a new Club roster with a list of Members, Addresses, Phone Numbers and Email ID. Receive all the files of the previous year from the predecessor. Please remember to take the Charter from the predecessor. Plan with the Members about the projects, fund raising and activities for the Club. Read the minutes of the previous meeting to the Members and have it passed at every meeting. Help the Treasurer to collect the dues from the Members. Help the Treasurer to send the dues to the District Treasurer. Encourage all your Members to attend the District Rally. Send nominations for the post of District Executive posts if you have qualified candidates in the Club. Monthly or Quarterly Report to be sent to the District. Ensure maximum attendance at District Rally by motivating the Members. Discuss with Members, plan and decide Club office bearers for the incoming year and choose eligible candidates as nominees for the District elections. The President will receive Association Ballots. IIW Ballots and Club Information Form will come to the Secretary. If this is not received inform the District Secretary at once. Encourage Members to attend the District Conference. In case of elections during the Conference, please see that the voting delegate attends. If the voting delegate does not attend for some reason, elect an official proxy in the Club and send a letter in the Club letter head stating who the voting delegate is. Complete the election of office bearers for the incoming year. Post the IIW ballots well ahead of time. Club Information Form should be posted to the District Secretary with the necessary data. Send in details of Addresses, Telephone Numbers and E-mail ID for the Incoming Officers of your Club to the District Secretary. Encourage the Incoming Officers to attend the District Assembly and training session. Please handover the minute books, charter and other records to the Incoming Secretary. N.B. : Per year, at least 10 Club General Body Meetings should take place, and one Annual General, Body Meeting in the Month of June. 20% of Members of a Club Constitute a Quorum. Any 2 months of the year may be kept as closed months, according to the convenience of the Club Members. Club Executive Committee Meeting should be held as often as necessary. For this Meeting, 4 Members of Executive Committee constitute the Quorum. The Vice President presides at the meeting in the absence of the President. She can gain much useful experience by helping her President in every possible way. The Immediate Past President provides continuity in the administration. The experience and knowledge she has gained during her tenure of office can be of great value. She cannot hold any office in her Club in the year following her term as Immediate Past President. N.B. : There will be no Immediate Past President for new Club in the year of inauguration. In fixing the annual subscription, the Club must ensure that it will cover the International Inner Wheel Capitation Fee, Association and District dues and sufficient day-to-day working expenses of the Club. A budget has to be prepared at the beginning of the year taking into consideration the tentative income and expenditure of the Club. At the beginning of the year during the Incoming and Outgoing Committee Meeting a resolution is passed as to the bank in which the account of the Club will be operated and the auditors who will audit the accounts of the Club. The account should be opened only in a Nationalized Bank/ Scheduled Bank. Fees, to be credited to the Club Administrative Account. Charitable donations and amount raised from fund raising to the Charities Account. The Financial year begins from 1st July and ends on 30th June. The Bank Accounts have to be closed on 30th June. Treasurer shall not be entitled to operate the accounts after 1st July. The accounts have to be audited at the end of the Financial Year and copies of the Audited Statement of Accounts shall be read out to Club Members in the General Body Meeting and one copy of the same shall be sent to the District Treasurer within 30th of September. If a Club has fixed deposits then the accounts has to be audited and a balance-Sheet duly certified. The Club Account can be presented with an Income and Expenditure statement. Club fees should be collected during the months of July and August. If subscription is not paid in time, reminders should be sent promptly. District and Association Fees and IIW subscription should be sent to the District Treasurer latest by September in the format sent by the District Treasurer. The District, Association and IIW Subscription are payable to all Honorary Members and Honored Active Members by the Club concerned. For Members joining after January 1st till 30th June, half yearly dues fixed by the Association have to be paid. For existing Members and new Members joining before December 31, full year fees has to be paid. Charitable donation received from Members and other sources must be used for the purpose it is collected. Treasurer must apprise the Executive Committee and the General Body every month the expenses incurred and the payments made during the month. A cash book and a ledger book must be maintained by the Treasurer or done in good accounting software. All payments sent to the District Treasurer should be sent by DD in the name of the.... 'Inner Wheel District 301'. All cheques / DD shall be A/c Payee only. All cheques must be duly signed by the Treasurer and President or Secretary. Normally Trust Account is not encouraged in the Clubs since it involved lot of paper work and legal complications. When a Club wishes to open a Trust Account, first the permission of the District Chairman is sought who in turn seeks the permission of the Association President. Accounts must be maintained separately and audited every year and copies sent to the District and the Association. Trust Deed should be duly registered and all rules with regard to the Trust Account must be scrupulously observed with requisite legal vetting and advice. Trust Deeds have to be properly maintained and abide by irrespective of out-going / in-coming President and Treasurer. Though, it is advisable not to have Trust Accounts. For the incoming-outgoing Committee Meeting, the Treasurer should be ready with the name of the Bankers and the Auditors. A resolution has to be passed fixing the Bankers. A resolution has to be passed for fixing the Auditors. A resolution has to be passed authorizing the Signatories whether it is Treasurer or President and Treasurer or Secretary. On 1st July, Treasurer should open the Club Administrative Account and the Club Charity Account in the Bank with opening cash-in-hand that can be reimbursed at a later date, if any. A budget has to be prepared about the Income and Expenditure of the Club with the help of the previous Treasurer and the President. Wait for the letter from the District Treasurer intimating the IIW Subscription, Association Fees and the District Dues. Place the order for Inner Wheel Literatures (IIW Directory, Association Directory, Constitution & handbook, Association Bye laws and Guidelines) from the Members and collect money for the same so that you can forward it to the District Treasurer. The letters containing the remittance of fees paid to the District. Bills and Vouchers for payments made. Help the Club President in planning the fund raising programme for the Club. Remind Members about the importance of the Dues payable to the Club and collect it from all the Members. Make sure the Club has to pay for all its Members including Honorary Members and the Honored Active Members. Full year's fees have to be paid for all the existing Members of the Club and also for Members joining during that current year. Full year's fee have to be paid for Members joining the Club till the end of December 31st and Half Yearly fees for Members joining after January 1st. Fees have to be remitted to the District Treasurer in the name of the 'Inner Wheel District 301 Payable at New Delhi by Demand Draft A/c Payee only. Along with the Demand Draft the list in the proper format giving the details of Membership should be enclosed. The bills pertaining to printing, stationary, postage, photocopying done by the office bearers etc., should be met from the Club Adminitrative Account. Bills / Vouchers have to be presented in the Executive Committee meeting get it passed and settle them with A/c payee cheques only. A proper knowledge of Income and the Expenditure made during the month is essential so that she can present the accounts to the Members of the Club at each meeting. Any Member not paying the dues by the end of December automatically ceases to be a Member of Inner Wheel. Full year fees have to be remitted for Members joining the Club during this period in the same format to the District Treasurer. Wait for the letter from the District Treasurer intimating the Half Yearly dues. If she has already intimated to you about the Half Yearly dues in the beginning of the year collect Half Yearly fees for Members joining after January 1st. Start preparing for handing over to the Incoming Treasurer and also guide her in preparing the budget. Consult the Auditor for all his requirements in finalizing the accounts of Clubs. The Auditor will require your Bank Pass Books, bills and voucher file, your ledger and day book. Help the incoming Treasurer in her work. Audit your accounts and circulate copies of the accounts to the Members before it is passed. A copy of the audited accounts should be read out to the Members of the Club during General Body Meeting. A copy of the audited Balance-Sheet should be sent to the District Treasurer. “The easiest way to keep schedules is to keep a schedule. It has been resolved at the Meeting held by the Inner Wheel Club of ………………………. at ………………………. For the year beginning ……………………. at …………………….. as Auditors of the Club. Minutes Book of the Executive Committee Meetings. Minutes Book of the General Body Meetings. Attendance Register of both Executive Committee and General Body Meetings. Audited Balance Sheet of the previous year. Bank Pass Books of all accounts holding by the Club for the current Financial Year. Original Charter of the Club. A visit to the project site could be arranged. I.S.O. file should be available. Important Addresses and Telephone Nos. Note: Despite every effort if any addresses/mobile numbers/telephone numbers be, inadvertently misprinted or if there is a later change of the same, please kindly inform the undersigned at the earliest the District Chairman. This would enable us to publish the corrected information in the forthcoming District Events / Souvenir. Note: Colour of Banner should be Royal Blue & writing should be White / Silver / Gold.